Abraaj is an Islamabad based fashion brand that is working hard for providing women the latest and the most stylish dresses. There are lots of fashion outlets working in the country but one always prefer the best and high quality outfits. 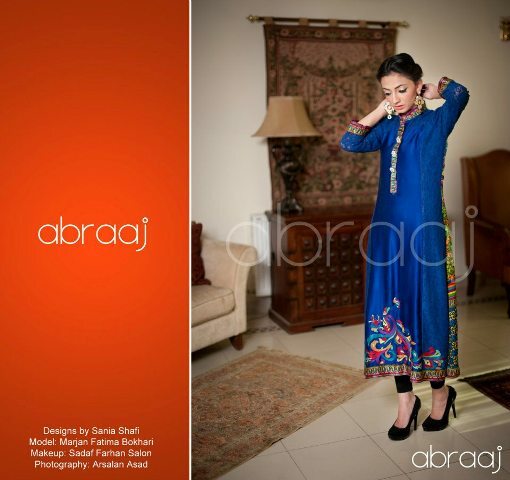 Recently Abraaj has launched formal collection 2013 for women that is trendy, stylish and of latest fashion. The colours of the dresses are very vibrant and enchanting that makes women look stunning and attractive. Furthermore, these dresses can be worn by women on formal and semi formal events. One can also see the great work of embroidery. Pictures of the dresses are displayed below. Please do give them a keen and considerable look. Prices can be bit high but one should always go for the best quality outfits.